Infected Root Canal | Symptoms Of A Root Canal Infection? What Is An Infected Root Canal? The term infected root canal has slightly different meanings depending which country you live in. In the United States and Canada, it will usually mean an infection in a tooth that already has a root filling inside it. In other regions, such as Europe and Australia, it usually means an infection inside a tooth that has not yet had a root canal procedure. I'll start with a tooth that has not yet had any treatment. A root canal infection is caused by bacteria getting inside the tooth, killing the nerve. Bacteria normally get into a tooth when it has a cavity. In rare cases, they can also infect the tooth if you have more advanced gum disease around a tooth. But this is quite unusual. Nearly all infected root canals are caused by a cavity in the tooth. The bacteria that cause the cavity continue to breakdown the structure of the tooth, softening the dentine, and finally getting to the nerve deep inside the tooth. So how do you know if you have a root canal infection? The first thing most people will notice is pain. The tooth will become sore to bite on at first. As the infection gets worse, it will become painful to any pressure at all. For most folk, this will be enough discomfort for them to go to a dentist. After all, when you can't chew anything because a tooth is so painful, you want to get it fixed! Left alone, the infection will get worse. The next thing may be a gum swelling beside the tooth. This is called an abscess. At this stage, the tooth itself may become a bit less painful to put pressure on, but the sore gum makes up for it! You will probably feel quite ill, and may have a mild fever. The swelling can get pretty big. In a back tooth on the bottom jaw, there is a possibility of it interfering with your breathing, if the swelling starts to spread into your neck. DON'T DELAY ! Get yourself to a dentist as soon as you can. I would recommend going to a dentist quickly, rather than wait and end up in the Emergency Room at the local hospital. In the image below, you can see one tooth root with a dark, circular area over the tip. This is an infected root canal. What about a tooth that has ALREADY HAD a root canal procedure? In this case, there will be a root filling inside the root. The whole point of doing a root canal filling is to fill up all the "dead space" inside the roots where the nerve used to be. So how has infection got inside the tooth? The filling has leaked. The most likely cause is leakage of the filling that covers the top of the root canal. Bacteria from your saliva can sometimes get in round the edges of a filling. Once they get to the root canal, they can get down the sides of a root filling very quickly, within days. This is because it is very difficult to get a really good "bacteria-proof" seal down the sides of a root filling. This is one reason why many dentists recommend a crown (a cap) for any tooth that has had a root canal, especially back teeth. There is no doubt that a crown will usually give a much better seal against bacteria than a filling. Sometimes, however, the tooth can be weakened significantly by the trimming-down that's needed for a crown. 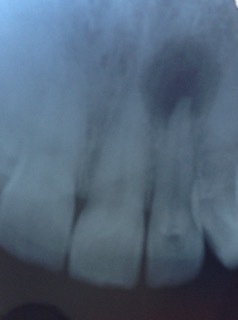 So the decision to put a crown over a root-filled tooth is not always automatic! A tooth with an infected root canal can always be treated, whether it's the first time the tooth has had root treatment, or whether a previous root filling is leaking. And it can always be re-treated, unless the root is cracked or the tooth broken below gum level. A root canal infection is NOT the end of the road! You can read more about root canal treatment at Dead Tooth. This one of the most popular pages on this website!